Geek Lit Etc. : Is a different view of the world wrong? One of the fastest-moving areas of science is psychiatry. Therapies performed as recently as the 1970s, such as lobotomies, are considered barbaric by current standards. Medications to treat mental illnesses such as schizophrenia and bipolar disorder have allowed patients who would have been institutionalized to be mainstreamed and live relatively normal lives. Advances in cognitive behavioral therapy let people with psychological disorders and traumatic brain injury gain the ability to live independently and even hold down jobs when before they would have been dependent on family or the state. 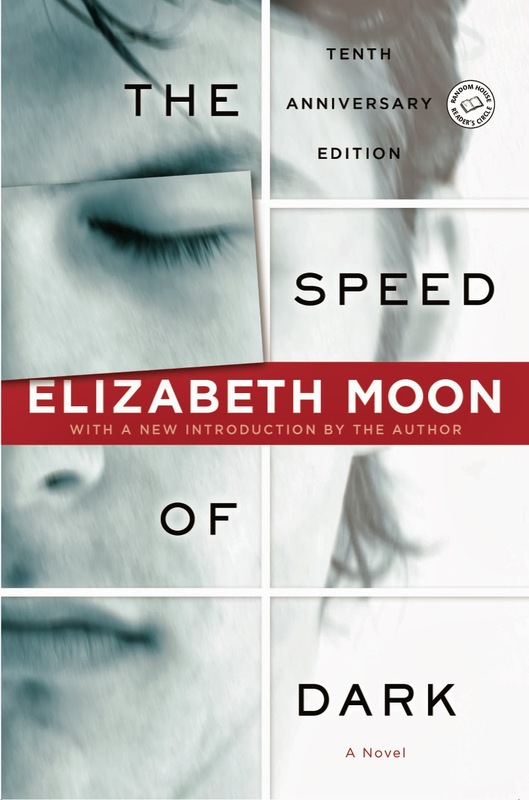 The Speed of Dark, by Elizabeth Moon, is a near-future look at autism. If Lou Arrendale had been born a generation earlier, he would likely be nonverbal, lost in his own mind, amid a world too overwhelming to be a part of. If he were born a generation later, the flaws that cause autism, either in-utero or in the first few years of life, would have been identified and able to be fixed, and he would never have been 'truly' autistic in the first place. But Lou was born when he was, and nothing can change that. As autism was being understood better and better, psychiatrists were able to create therapies that teach the afflicted how to interpret the world. Computer programs are able to slow down speech sounds to a rate that an autistic child can understand, and then slowly speed them up to normal speech. Because 'autists' have a hard time picking up on social cues, therapists know to teach appropriate responses to common situations, and show the patient how to extrapolate what might be the correct response in new situations as well. The training is hardly perfect; stressful situations such as the security screening areas of an airport can still cause the person to freeze up, but for day-to-day activities, Lou's final generation of autists is now able to enjoy independent lives. Lou has a very full, fulfilling life. He lives independently, in an apartment near his work. He enjoys weekly fencing lessons at a friend's house, and has feelings for one of the women that attends as well. He works for a pharmaceutical company, in a department staffed completely with autists, discovering patterns in research that neither computers nor neurotypical employees are able to find. He understands that the way he thinks is still different from 'normal' people, but it's the only way he's ever known. Life never holds still, though, as much as one might want it to. A new member of upper-management wants to remove the special facilities that allow the autistic department to keep their focus and ability to do their work so efficiently. One of the women at the Center, where many of the autists spend their free time, has begun confronting Lou about his 'normal' friends. A jealous would-be suitor at fencing club may be even more unstable than the rest of the people Lou associates with. And then Lou is faced with a decision: continue on with the only life he's ever known, or volunteer for an experimental treatment that may reverse his autism. Elizabeth Moon creates a near-future world that is completely believable. All of the technological advancements posited are completely believable, given the current state of science. As the mother of an autistic son, Moon had eighteen years of research into autism to draw from, as well as countless hours of interviews with patients and doctors alike. The result is the most comprehensive, true-to-life work about autism written. With characters that the reader grows more and more emotionally connected to, a corporate conspiracy, and a vandal becoming dangerous, The Speed of Dark is a masterful work of fiction that needs more exposure. Highs: Lou's direct supervisor is a more sympathetic character than I first expected. Verdict: An amazing, captivating read that, even with a flawed ending is well worth the read.